You won’t be disappointed in a Freedom of the Seas cruise, after extensive renovation brought some of Royal Caribbean cruises’ best features to the ship. 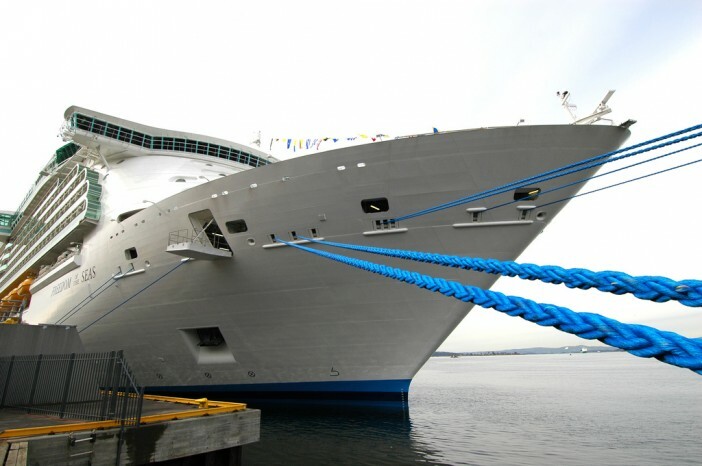 To check out the latest deals visit our Freedom of the Seas cruise deals page, or read on to find out what’s on board. What’s there to do on Freedom of the Seas? Freedom of the Seas is home to a massive range of activities and facilities – you’ll never find yourself bored whether you’re into rest & relaxation or thrillseeking! The more adventurous types will enjoy the rock climbing wall, the Flowrider surfing simulator or maybe even the boxing ring. Or if you’re looking to relax and unwind, the Day Spa has a range of beauty treatments and whirlpools. You can also rest in the sun by one of the on-board pools. Kids (and maybe just the adults too!) will be thoroughly entertained by The Dreamworks Experience – with some of their favourite movie characters, including Shrek, joining them on board! The Experience also includes movies shown in 3D on the cinema screen. When it comes to food, you’re spoilt for choice. The Main Dining Room offers delicious dishes and great service, all included in the price of your ticket. Meanwhile, the specialist restaurants offer high-end cuisine from around the world for a small added charge. Chops Grille – serving delicious steaks and salmon. Sorrentos – pizzas, cooked just how you like them. Portofino – Italian classic dishes. Johnny Rockets – a 50s-style burger bar. There’s also a Ben & Jerry’s ice cream restaurant and cafes ready and waiting. Accommodation is spacious and luxurious, no matter what type of room you choose. For those on a tighter budget, the interior staterooms offer great value for money – no frills, but all the amenities you’d expect including a TV, telephone and safe. For a small amount extra you can stay in an outside stateroom with your own view out across the ocean. For your own private balcony and a little extra room, choose one of the Balcony Suites – great for taking in the sea air in peace. Or if your budget will stretch to it, the Suites and Deluxe staterooms provide the very best living experience Freedom of the Seas has to offer. These rooms are spacious, beautifully decorated and come with a number of exclusive amenities, like priority check-in & departure, luggage valet service and concierge service. Visit our Freedom of the Seas cruise deals page for all the latest deals, which are updated on a regular basis. Or to see more of the latest deals, use the search tool to find out what else is available.